Four men arrested in the underground system in the early hours of Easter Monday may have been “urban explorers”. Picked up on CCTV near Russell Square tube station, the presence of the men sparked a terrorist alert, but it appears that they were looking for a disused tube station in the area. The Transport Police, who stressed the dangers of gaining unauthorised access to the tube, arrested the men, all of whom are from south-east England, on suspicion of railway trespass and burglary. They were later released on bail. Urban exploring, gaining access to derelict urban structures, has become increasingly popular across the UK over the past decade. As well as thrill-seekers, many explorers are serious photographers who love to capture the haunting decay of London's urban environments. Enthusiasts are usually discreet as urban exploring is on the fringes of legality. Trespass is a civil rather than a criminal offence under UK law, but incidents such as this risk prosecution. Online forums such as 28dayslater.co.uk provide a communications hub for the movement, a place where explorers can chat and file in-depth reports. Users on the forum appeared to be aware of the incident. “Looking forward to the report on that,” wrote one. Other comments showed concern about the arrests. “I do wonder if this sort of bust takes us another step closer to laws to make the taking of photographs an aggravated form of trespass,” read one. Image by jeffsb* via the Londonist Flickr pool. 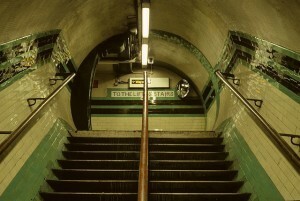 Interested in old tube stations?